If you have ever visited the Omaha Henry Doorly Zoo, you have been privileged to the amazing facility we are fortunate to have in our area. 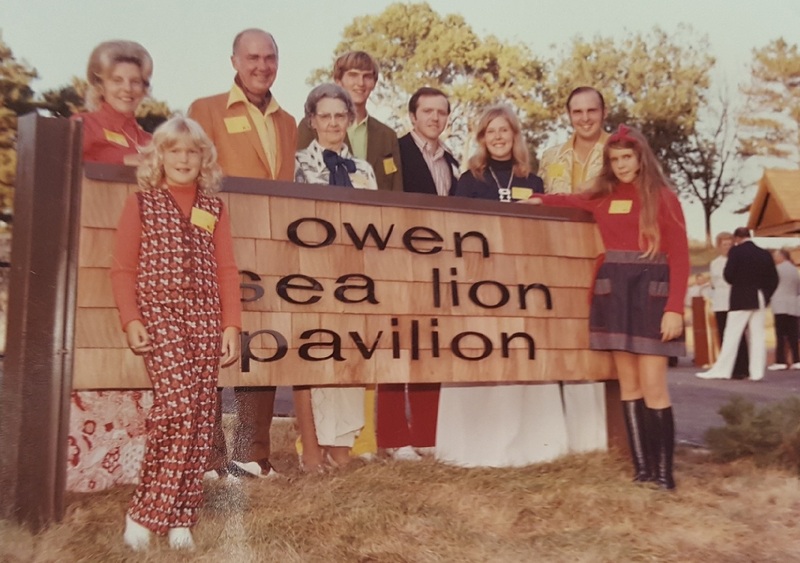 Ed Owen brought us the Owen Sea Lion Pavilion in 1972! As a member of the zoo board, Ed met with Lee Simmons (then Director of the zoo), with the idea of excavating old Riverview Park Swimming pool that had opened in 1916, closed in 1938 due to the polio epidemic, and later buried in 1944. Ed served as Zoo Board President and President of the Omaha Zoological Society for three years. Ed and Dee donated $250,000 to the Sea Lion Pavilion project. The Owen Sea Lion Pavilion hosts a 333,000 gallon, 85-foot by 100-foot oval shaped pool, a picnic pavilion, a small grandstand, a snack bar, a souvenir shop and public restrooms. 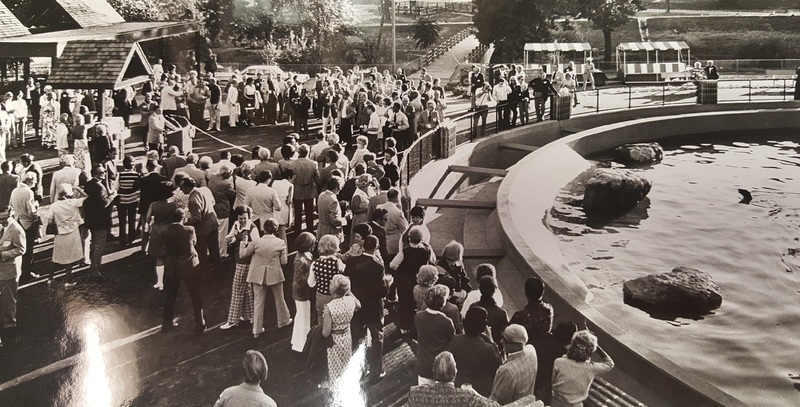 It was dedicated Saturday, August 26, 1972 by Ed and Dee Owen and Omaha’s Mayor Eugene Leahy. 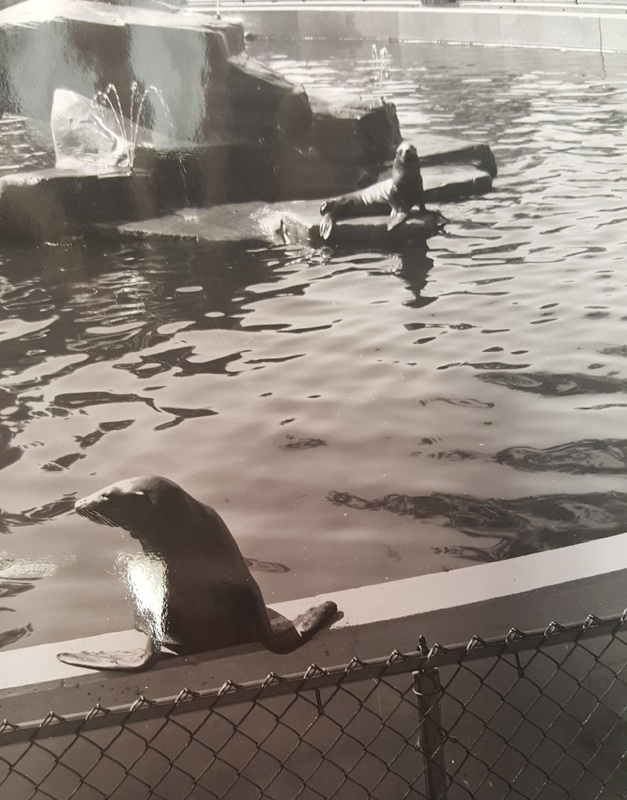 Six sea lions flown in from Santa Barbara island were the stars of the exhibit and named after Ed and Dee’s six children; Robert, Barbara, Carolyn, Richard, Katherine and Peggy. The hairiest one was named Robert after his impressive mutton chops. The zoo purchased the sea lions for $150.00 each. In late 1970 a board member, who owned a large steel fabrication company, told me he was going to London on business. He asked if there was a zoo there that he should visit. The answer, of course, was Regent’s Park. He asked if we might have a contact who could show him around and I said yes. Not long before Ed Owen had come into the office, I had been grumbling one day that we didn’t have a sea lion pool. That same old city plumber who had worked in the park since high school told me, “You do have a pool if you just dig it up.” I asked him what he meant and he told us that buried on the east side of the lagoon there was an old swimming pool which had been built in 1916. The city had apparently discontinued using it in 1938 because of the polio epidemic. The city had discontinued use of a number of other swimming pools during that same period. They had poured a new floor in the pool but instead of reopening it, as they did with some others, they ultimately buried it in 1944. The area was a gentle hillside with no sign of anything ever having been there, but when we examined it we could see a faint yellow convex arc in the grass close to the lagoon where the edge of the pool was just below the grass roots. A faint yellow concave arc in the grass further up the hill was just above the top of a buried retaining wall. We borrowed a front-end loader and two dump trucks from Bob Brown and the UP and dug the pool out. It was oval in shape, sloped from a depth of two-and-a-half feet to eight feet and had a calculated volume of 333,000 gallons. The walls and floor of the pool were in good shape. Now we had to figure out a way to convert a 54-year-old swimming pool into a sea lion pool. It was right after this that Ed Owen walked into the office inquiring about zoos in London. I tried writing to the London Zoo, but it was during the big English mail strike, so I finally placed a transatlantic call to their director during London working hours. After a bit of discussion, it was agreed that someone from their staff would pick Ed up at his hotel and give him a guided tour of Regent’s Park Zoo. It just happened that the staff member who picked Ed up was the London Zoo’s marine mammal specialist and he just happened to talk about sea lions all day long. With more help from the Union Pacific Railroad and Ed’s funding, we converted the old swimming pool. We installed a shallow moat around the pool and installed a new drain with a 24-inch butterfly valve in the deep end to flush the water into the lagoon. We buried a holding building into the hillside. Additionally, we built a concession stand, picnic pavilion and public restrooms. 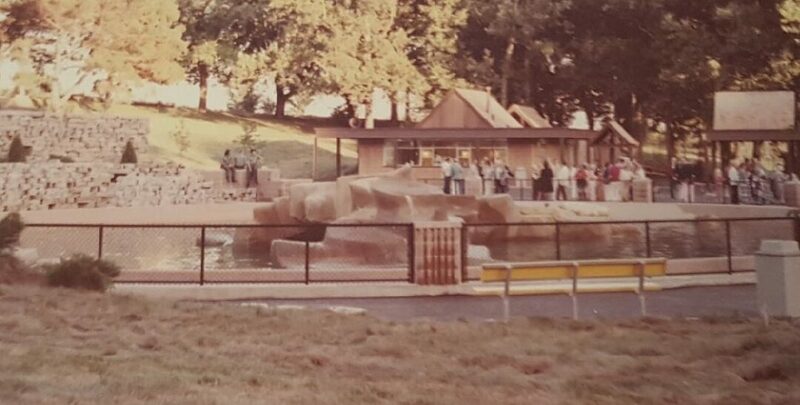 We dedicated the Owen Sea Lion Pavilion in 1972. Ed ultimately became chairman of the board for a number of years. 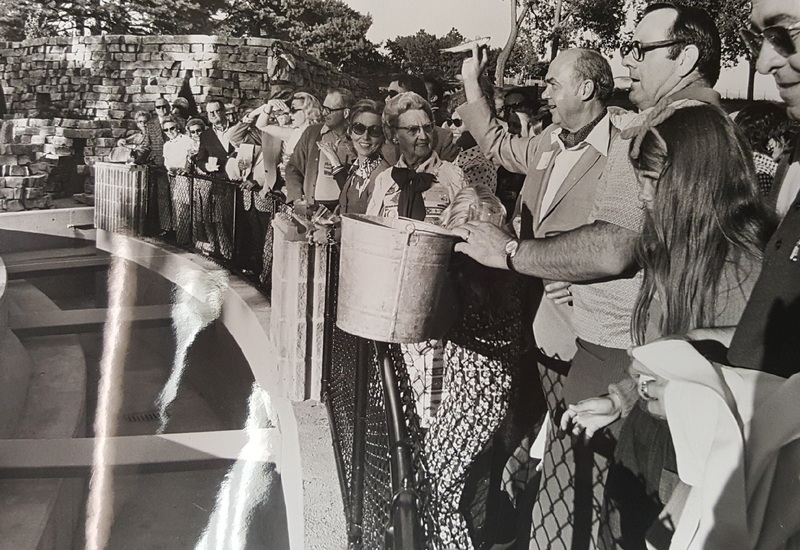 The artesian well, with a new 100-horsepower pump, supplied water to the sea lion pool and lagoon for many years until we drilled a second well near the north gate. The zoo is beginning work on a huge transformation of the exhibit that should be completed by 2020/2021. We can’t wait to see it! Pups weigh about 13-20 pounds and are 2.5 feet long when they are born. Females can weigh between 200-400 pounds and can be up to 6.5 feet long. Male sea lions tend to be larger, weighing about 600-800 pounds and can be up to 8 feet long!